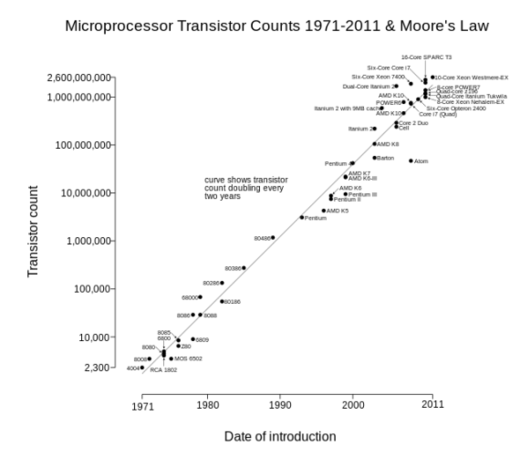 Over the weekend, Moore’s Law—the prediction that the number of transistors (building blocks) on an integrated circuit (computer chip or microchip) would double every two years—turned fifty years old. It so happens that the silicon solar panel, the dominant variety in the market today, is about the same age—roughly fifty-two years old. And over the last half-century, while the computing power of an identically sized microchip increased by a factor of over a billion, the power output of an identically sized silicon solar panel more or less doubled. The contrast between Moore’s Law for microchips and the plodding progress of clean technology is bittersweet for me. Growing up, I would wait impatiently for my father to bring home a new computer, powered by a faster, next-generation processor—his office was across from Gordon Moore’s at Intel. When he founded a solar panel start-up, he brought the limitless optimism of Moore’s Law with him, but like myriad other cleantech start-ups, his company struggled to stay afloat given the surging tide of cheap, mediocre silicon solar panels from China. My own doctoral research focused on exciting alternatives to silicon solar panels, but those alternatives face a daunting barrier to entry from large silicon firms. So while I celebrate the startling prescience with which Gordon Moore, in 1965, predicted the density of transistors fifty years hence and every year in between, I reject the notion that clean technologies like solar panels and batteries follow a Moore-esque decline in cost. 1. Moore’s Law is a consequence of fundamental physics. Clean technology cost declines are not. 2. Moore’s Law is a prediction about innovation as a function of time. Clean technology cost declines are a function of experience, or production. 3.Why this all matters. Moore’s Law provided a basis to expect dramatic performance improvements that shrank mainframes to mobile phones. Clean technology cost declines do not imply a similar revolution in energy. Difference #1: Moore’s Law is a consequence of fundamental physics. Clean technology cost declines are not. When Gordon Moore made his prediction in 1965 (original article in Electronics here), that the most economical number of transistors on a computer chip would double every two years, he based his reasoning on the physics of transistors. In hindsight, Moore’s physical instinct was confirmed: “As the dimensions of a transistor shrank, the transistor became smaller, lighter, faster, consumed less power, and in most cases was more reliable…it has often been a life without tradeoffs.” In other words, Moore’s primary insight was that shrinking the transistor made it work better—as a happy corollary to this shrinkage, the cost per unit of computing power kept falling, because the cost of manufacturing the same chip area has remained roughly constant. On the contrary, clean technology cost declines have very little to do with the physics of the actual devices being built. For example, falling costs of silicon solar panels have largely been driven by lower input material costs from scale, lower labor costs through manufacturing automation, and lower waste driven by efficient processing. All of these cost reductions follow naturally from manufacturing scale and vertical integration, rather than performance improvements. Now Tesla hopes to achieve similar cost reductions by building a Gigafactory—a massive facility in Nevada—to scale up production of lithium-ion batteries that will only perform incrementally better than the current generation. Difference #2: Moore made a prediction about innovation as a function of time. The advances of clean technology are a function of experience, or production. The physical principles that underpin favorable microchip shrinkage enabled Moore to predict that transistor density would double every two years, rather than predict progress based on the quantity of microchip production. Indeed, fulfilling Moore’s prophecy has required scientists and engineers to sit down at the drawing board and redesign each new generation of microchip down to the basic architecture of the transistor—Moore himself predicted that his law would require engineers to employ “cleverness.” Manufacturing advances, for example to enable printing ever more miniscule features on a chip, accompanied the design decisions to change the transistor architecture and chip design. Microchips certainly got cheaper as a result of manufacturing scale, but the increased production was never a sufficient condition to meet Moore’s Law—fundamental research and development (R&D) drove the advances. By contrast, clean energy devices basically look the same decade after decade. Instead of R&D advances, solar panels and batteries have come down in cost through the benefits of experience and scale, closely related to “learning by doing.” But this relationship between cost and production quantity—the “experience curve”—is a generic one cutting across many industries, from aerospace to chemicals. “Wright’s Law” and “Henderson’s Law” describe the inevitable cost reductions that accompany an industry’s increased experience through scale production of a good. These purported laws do not specify a numerical estimate for the experience curve’s slope—it happens to vary widely among industries. Although Moore’s Law is also, strictly speaking, not a law but an observation, it was extraordinary because it was a specific, quantitative prediction which the microchip industry proceeded to closely follow. 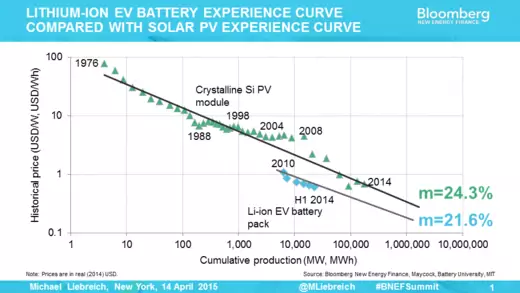 Bloomberg New Energy Finance’s Michael Liebreich pointed out last week that the experience curves for solar and batteries look awfully similar, apparent from the similar slope estimates given on the slide. Perhaps this will enable a reliable prediction for the falling cost of batteries as they scale up. But whereas Moore could set a future-looking roadmap with real dates that the industry could target, setting a roadmap based on an experience curve requires perfect forecasting of future production, which is difficult, especially in a rapidly growing market. Difference #3: Moore’s Law provided a basis to expect dramatic performance improvements that shrank mainframes to mobile phones. Clean technology cost declines do not imply a similar revolution in energy. To put this all together, Moore’s Law worked so well for microchips, because Moore had a set of physical reasons to believe in his prediction: that the density of transistors on a chip would inexorably increase as the years passed, because transistors just work better when they are smaller. And by making a specific, quantitative prediction, Moore’s Law became a self-fulfilling prophecy—industry leaders like Intel and Qualcomm published technology roadmaps that signaled their intention to match Moore’s Law so that financial markets and the rest of the computing ecosystem knew what to expect. As a result, electronic devices evolved in lockstep with the evolving, shrinking transistor, and today’s mobile phones have more memory and computing power than supercomputers in the 1980s. A different and generic phenomenon—the experience curve—characterizes solar and battery cost declines. If these cost declines were accompanied by performance enhancements, then an industry roadmap could spark synergistic innovation—new long-range electric vehicle designs might evolve alongside lighter batteries. But as costs decline while performance stagnates, it is not just a matter of time before an electric vehicle with a thousand mile range emerges; instead of leading energy innovation, clean technology firms merely peddle commodities. Today, the total cost of putting solar panels on a rooftop is over four times the cost of the panels themselves, so absent efficiency gains, the falling costs of solar panels, however predictable, only play a minor role in the final system cost. Moore’s Law is so special because the prediction it did make about the shrinking transistor resulted in a digital revolution that was completely unpredictable. Although Moore’s Law does not apply to the consistent cost declines of clean technologies, an appreciation for the dynamism that accompanied fifty years of regular progress in electronics could inspire advances on the energy front. This comparison is not apples to apples, because there is only so much of the sun’s energy that a solar panel can convert into electricity (its “efficiency”). 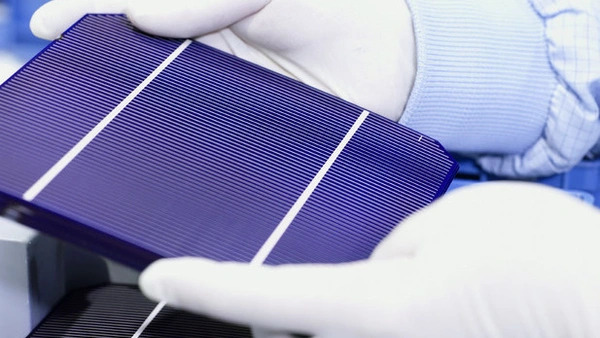 Still, commercially dominant silicon panels are only around 15% efficient, only twice as efficient as Sharp’s inaugural 1963 solar module, whereas much higher efficiencies (>40%) have been demonstrated in labs and in the field. In other words, commercial solar panels are performing well below their potential today. To derive the computing power density improvement, I compared the 1963 IMB Gemini Digital Computer (~7,000 floating point operations per second (FLOPS)) with the 2013 GeForce GTX 780 r.2 chip (~4,000 GFLOPS) and adjusted for size. Fittingly, my father went back to a world governed by Moore’s Law. He now leads research and development at SanDisk, and, confronted with the physical limits of shrinking transistors to just a few atoms wide, he is determined to keep pace with Moore’s Law by stacking transistors on top of each other. One report notes that a Moore-esque time-based prediction and production-based experience curve predictions are actually equivalent under exponentially increasing production. Since clean technology production seems to be following exponential growth, in the near term it may be possible to forecast a roadmap in terms of dates rather than production quantities. However, the case of microchips is instructive—as soon as microchip production stopped growing exponentially and leveled off around the end of the 1990s, transistor shrinkage started to outpace the experience curve, demonstrating that Moore’s Law is fundamentally a function of time, not production.